On the Bay of Plenty coast overlooking New Zealand’s only active marine volcano, Whakatane is a stunning town to spend a while. The mix of long-stretching beaches, rugged coastal headlands and native bush provide some stunning landscapes to explore, therefore keeping the activity costs to a minimum when you can just “enjoy the view”. 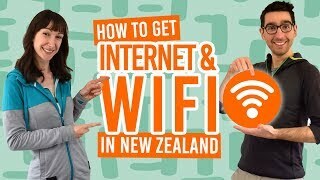 On top of that, there are more cheap things to do and free things to do in Whakatane that will keep anyone entertained, both day and night. In between filling up your time in Whakatane with these free and cheap activities, make sure you don’t miss the highlights on the town on this 10 Whakatane Must-Dos list! 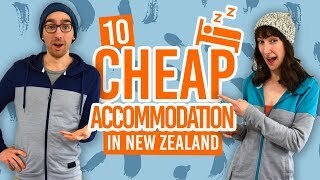 To help you stick to your budget in Whakatane, choose from these 5 Best Backpacker Hostels in Whakatane. With 11km of sweeping gold-sand beach looking out to the vast Pacific Ocean, Ohope Beach is one of the most-loved beaches in the Bay of Plenty (and the whole of New Zealand for that matter!) The area gets an abundance of sunshine and warm water in summer making it a super popular holiday destination. Hidden over the headlands at the west side of Ohope Beach is Otarawairere Bay. It’s the perfect picture opportunity with ancient pohutukawa trees lining the beach and shells scattered across the sand. Explore the tidal pools and enjoy the serenity of this bay that is often secluded. The Whakatane Library and Exhibition Centre is essentially Whakatane’s museum, with three exhibition galleries with ever-changing displays. See thought-provoking art and get a rich (and free) cultural experience in Whakatane. Location: Esplanade Mall Kakahoroa Drive. This 18km loop walk takes in the best coastal scenery and historic pa sites in the Whakatane and Ohope area. Marvel at the views from the cliff tops, find yourself secluded beaches, and walk in the forest to the sound of native birds. Either tackle the whole 18km or just do small sections of the walk that we list in 10 Must-Do Walks in Whakatane. The Ohope Scenic Reserve is not only an amazing place to do bush walks but is home to more than 300 kiwi! 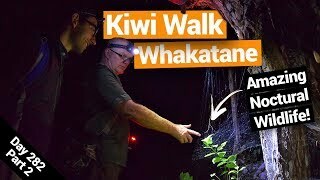 Take a walk after dark to hear (or maybe even see) kiwi birds foraging at night. You’ll also see lots of nighttime critters like tree weta, glowworms, eels, spiders and more. Signs with reflective markers point out wildlife hangouts along the way, so take a torchlight and enjoy this 1-hour loop walk. The walk is also part of the Nga Tapu o Toi (see above). Location: Start from the car park and carved archway on Ohope Road. Whakatane is lucky to have not one but two berry farms selling super fresh berry ice creams. Watch the orchard workers pack berries through the viewing windows at Blueberry Corner or play mini golf and feed the farm animals at Julians Berry Farm. Note that these venues are only open from late September through to March. Location: Julians Berry Farm, 12 Huna Road and Blueberry Corner, 364 Thornton Road. You can always rely on the cinema to kill a couple of hours without spending too much! It’s no different in Whakatane where the Whakamax shows the latest blockbusters and serves delicious ice cream, waffles and coffee. Don’t miss their Cheap Tuesdays where it’s NZ$9 per adult all day. 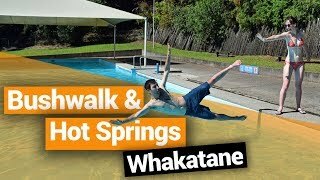 Just outside of Whakatane are the thermal mineral pools of Awakeri Hot Springs. Relax and chat with friends in their large partially covered main pool, or treat yourself to a private pool. There are also two children’s pools. 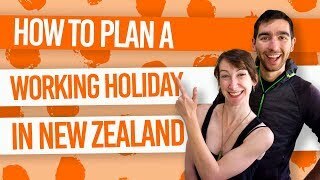 At NZ$7.50 per adult, it’s an activity that you can definitely afford. Location: State Highway 30, Awakeri. Walking and mountain biking are two of the best ways to experience the remarkable forest of the Whirinaki Conservation Park. On the edge of the Te Urewera forest, Whirinaki is often overshadowed so don’t miss your chance to explore this true hidden gem. Hike the 4-hour Whirinaki Waterfall Loop or go on a multi-day adventure on the Whirinaki Track. Check out some of the mountain bike trails here in 6 Must-Do Bike Trails in Whakatane. Location: 1h45minutes from Whakatane. Take State Highway 30 onto Macdonald Road to Murupara. Head past on State Highway 38 Minginui village and up River Road to the River Road car park. Wander among rose gardens, herb gardens, walkways lined with bulbs, shrubs and perennials in the beautiful Whakatane Gardens. There’s even a small Japanese garden that was contributed by Whakatane’s sister city in Japan, Kamagaya, which makes a lovely photo opportunity. In summer, you’re likely to stumble upon a concert, play or cultural event at the amphitheatre. Location: On the Whakatane Riverbank between McGarvey Road and McAlister Street. A great place to take a walk and hang out with friends is at the Awatapu Lagoon. This lagoon was once part of the Whakatane River and is now surrounded by lush vegetation and native trees. You’re also likely to see a few birds here too. Location: Awatapu Drive and Hinemoa Street. Accessible from the city centre, the Warren Cole Walkway is a sealed walkway and cycleway following the Whakatane River. The walk runs between the Whakatane River Bridge and the Whakatane Heads on a journey past sculptures, parks, wharves and more. The walk takes around 1 hour to complete both ways. Location: There are several access points along the Whakatane Riverbank in the city centre. History and amazing views combine on this stunning walk Ohope. The distinct terraces can be seen carved into the hill of this once fortified Maori village. The pa site was occupied for around 200 years thanks to its strategic position overlooking the Ohiwa Harbour. Learn all about its fascinating history at the interpretation panels at the beginning of the 30-minute walk. Location: About 300m on the left past the start of Wainui Road, Ohope. A small yet colourful park, Waiewe Camellia Park will brighten anyone’s day, especially in spring. See vibrant camellias and michelias in this small reserve that has restored by the local community. An easy walk for the whole family, the White Pine Bush Reserve loop walk takes only 30 minutes through stands of amazing kahikatea trees (white pine). The forest harbours many bird species like tui, fantail, bellbird and much more! The best place to get views of Whakatane is at the Puketapu Lookout. Puketapu (sacred hill) has been a lookout site for the local Maori, the Ngati Awa iwi, for more than 600 years. The site is now a reserve where you can park up and enjoy the views. Location: Intersection at Hillcrest and Seaview Roads. With fresh seafood and shellfish right off the coast, Whakatane is a great place to experience the local cuisine. Whatever your taste or mood, there is a Whakatane restaurant/takeaway/cafe to suit! Grab some classic Kiwi fish and chips and eat them on the beach or head to the Sunday Market for some fresh local produce. Head over to our Cheap Eats in Whakatane article where we’ve listed the best-value eateries in town! 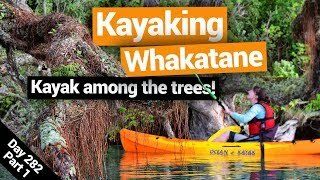 For some iconic views in the Whakatane area and just an awesome place to hang out and have a picnic, head to Whakatane Heads (Te Haehaenga). Whakatane Heads has the backdrop of the forested Kohi Point with views of Pipi Spit and the famous statue of Wairaka on top of Turuturu Rock. Location: End of Muriwai Drive.